So someone turns up with a collection of drip paintings hidden away for years in a Long Island storage shed, and a claim is made that they are the work of Jackson Pollock. A study is done, turns out that some of the paints could not have existed when Pollock was working. Quite a bit of money and some careers are at stake one way or another, all based upon the question of whether Jackson Pollock was the painter. Curiously absent from the whole discussion, at least as it has reached the press, is a voice willing to step up and say -- without regard to provenance -- whether the paintings are any good. Indeed, there is little information to be found about the paintings at all beyond the possible Pollock connection. What would have happened if the whole story had been framed differently, as a newly discovered cache of drip paintings by an unknown artist? How valuable would the paintings then be? Would our assessment of Pollock or of the drip painting history in general be changed? The Mozart year had a small coda with the apparent discovery of a juvenile piano piece (which the papers liked to identify, in typical overstatement, as a "Concerto"). What was added to our knowledge of Mozart with the piece? What was added to the piece by I.D.-ing it as Mozart's? On the other hand, what can that piece do for a scholar's career if the I.D. is accepted or rejected? And for the "first" performer or the first recording? These things really have a lot to do with contemporary careers and reputations, sometimes a bit (in the case of the Pollock, a large bit) to do with money, and are sometimes entertaining. I've enough ethnographic training to recognize the importance of context, but in cases like these, I just want to hear a case made for the works themselves. In Flann O'Brien's novel The Dalkey Archive, James Joyce appears as a character, a timid and pious shadow of a man, bewildered and distressed at his public image (avant-garde, obscene, anti-clerical). While O'Brien's Joyce is pure fiction, an impossible parody, the image of the naive artist fundamentally misunderstood by his audience has stuck with me. In fact, the image recently returned to me when I was confronted with a remark about the composer Anton Webern. Webern, as well as I can imagine him, was a modest, if not timid, and somewhat naive man, who, had he survived his tragic shooting, would likely have been distressed by his post-war image as a radical, an intellectual, and a figure central to subsequent developments. We know Webern through all of the lenses of hindsight, and they often function like the trick walls of glass and mirrors in a funhouse, as we can't tell whether his contradictions were his or are a part of his reception history: Webern is at once a mystic and a cerebrial calculator. An ultra-modernist with a slick international style but also a devoted exponent of the tradition of Viennese Espressivo. He was a born aristocrat who became sort of a leftist and then a sort of nationalist. His scores were minimal and discrete, yet his performance style was to heighten contrasts in tempi, dynamics, and articulations and thus force the discrete events in his scores into continuous dynamic curves. Webern was an unlikely figure to place at the center of the repertoire for a number of reasons. Like Varese and Ruggles, he was a composer with a modest catalog, so modest, in fact, that the complete set of works with opus numbers fit on three lps. And his modesty of scale must be constantly reassessed as to whether it is a result of either compositional failure or aesthetic preference, or even both. Failure on Webern's part can be recognized both in the fact that several of the pieces published as "complete" by Webern now are shown, through the sketches, to have been intended to carry additional movements, and in the fact that, within a movement, Webern had not found a way to extend his methods and materials beyond the smallest instances. Although Webern also appears, at several moments, to have grossly over-estimated the duration of his pieces, there is a strong aesthetic argument to be made for his brief, but intensive and detailed, scores as exemplars of a minor music, a classification that is not meant negatively, and is akin perhaps to the case that Deleuze makes for Kafka's as a minor literature. But still, in the aftermath of the second world war Webern's music somehow became a rallying figure for the newest avant-garde. Whether Babbitt or the New York School around Cage, or in the moment that was the Darmstadt School, everyone was finding the Webern that they needed. Scores were difficult to find, and until Robert Craft's boxed set, recordings, as well. It was a ritual of passage for many young composers to copy a Webern score out by hand (I even did this myself in the '70s with the Symphonie and the posthumous Kinderstück, as photocopies were expensive on a paper route), and to carefully analyze the scores, which usually meant accounting for every single note in terms of rows and row forms. His preferences for symmetry and economy were celebrated. But the naive mysticism of the Hildegard Jone texts and the extreme expression of the playing style as conveyed by musicians familiar with Webern (e.g. Otto Klemperer, Peter Stadlen) was largely ignored, and for many, emphasis was placed upon those abstract pitch structures and symmetries, and more upon the instrumental than the vocal works. 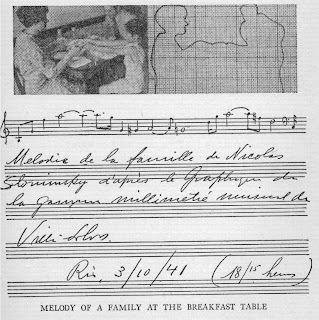 It's almost shocking now to learn now, with a better command of the sketch evidence, that Webern wrote out his rows in a manner that was stumbling and tentative rather than confidently systematic, and that he really worked with his rows as melodies, taking his texts and their settings seriously, and viewed himself as principally a vocal composer rather than as a specialist in absolute music. Some composers did, in fact, focus upon Webern's sound rather than his structures: Goeyvaerts, Feldman, Wolff, Young and Reich all zeroed in on a static background harmony in his pieces, in which pitches tended to return in the same register. Nowadays, however, that sonic impression of Webern seems to be locked into the now-passé performing style of the Craft recordings. (we are now confronted with the phenomena that in order to understand much of the music written in the wake of Webern, we must try to recreate a performance practice for Webern that is now long out of fashion). Webern was a musicologist who became a composer. Bartok was a composer who became a musicologist to get material for his music. I'm a composer who became a musicologist to get a job. It's a witty bit, but unfortunately, it might totally mislead someone about Anton Webern. Webern's ambitions were always those of a composer and -- to an extent limited by serious stage freight -- as a conductor. Musicology was not his career. The study of musicology was, however, a suitable way for Webern, as a member of the minor aristocracy, to enter the music profession. Academic study -- as opposed to a practical, artistic training like that of a composer -- was always acceptable for young men from "good families", and musicology was what one studied in university, not composition. Webern completed his career as a musicologist at the age of 23 with his dissertation, and never returned to serious historical research. Webern's initial attempts at composition came before his University enrollment, and his musicological studies were apparently never so intensive as to restrict his concurrent private composition study with Schönberg, study which would continue for two years beyond the publication of his dissertation. The blogger-who-shall-not-be-named-here compared Webern with Bartok, unfavorably it seems, identifying Webern's musicology as a career and Bartok's tune collecting as work in service of his compositions. This may have initially been the case, but Bartok's engagement with his ethnomusicological work became a central concern in itself, and he increasingly chose to put a substatial part of his compositional work to the side in favor of his transcriptions, the bulk of which have nothing to do with his compositions. The other disagreeable aspect of this is an assumption that doing musicology (or ethnomusicology) is an activity of lesser intrinsic value than composing, and is carried out either by people who would otherwise be composing or by people who are plain unable to compose. That's both wrong and mean-spirited. A musical life means going where your muse sends you, and sometimes the muse sends a soul into scholarship. Musicologists have shared some remarkable discoveries with us and that's worth treasuring, even if they have often been, as a community, notoriously conservative, and slow to take interest in many vital areas. While I do have my own small stack of musicology horror stories, they shouldn't be used to condemn the whole enterprise upfront. I recognize that I lack the temperament to do what musicologists do, and am glad that there are people around with the patience and skill set required to help us re-imagine worlds of music we have lost or forgotten. That leaves the more interesting work -- of imagining worlds of music that have never existed, whatever their roots in the past or in other places -- to us composers, and that's precisely the kind of work that Webern did. All together now: Webern was a musicologist who became a composer. I've been tidying up a score for string quartet. In the process, it became clear that the 1st violin part, while generally playing in a higher register than the 2nd, has a part that was, by any measure, considerably less difficult than the 2nd. Indeed, it is also much less difficult than the viola and cello parts. It is also a part that was understated, not standing out much from the ensemble, giving little opportunity for the player to distinguish his/herself. When composing, I tend to keep ease or difficulty of playing on a back burner, not giving it much thought. The notes in my pieces are generally not too difficult to produce, with the problems for the players laying in other, less mechanical dimensions. But, in the case of this part, I saw quickly that, when trying to get the score played, the simplicity of the 1st part could carry a collateral liability. (If I composed music for choir, or wind band, or pedagogy, I suppose that difficulty level would be a more pressing concern). In its beginnings, the quartet, as a genre, was a showpiece for the Primarius, the first fiddle player. 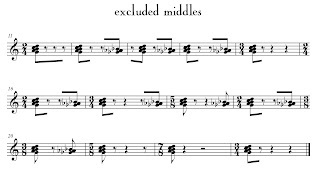 When not actually technically difficult, giving the first something showy was expected, and early quartets are often feel a bit like mini-concertos, stripped of their cadenzas, and with the three others assigned largely to accompaniment. But as the quartet emerged as a music-intellectual center of the repertoire, with composers realizing its great potential as a vehicle for four-way virtuosity and a wide variety of scoring patterns (let's count 'em: four solos, six duos, alone or combined with complementary duos, or with one or two soloists, four trios +/- a soloist, and the full quartet), it gained prestige and became something more of an egalitarian institution. Well, almost. While a few quartets have taken a consequent egalitarian program, rotating the 1st and 2nd parts between the two violinists (the fine Bozzini quartet is a contemporary example), standard practice remains that one player holds the first chair, always plays the first part, often has a veto over his or her colleagues in matters musical or practical, sometimes gets paid a bit more, and often, the quartet even carries the family name of the Primarius. First among unequals. What this can mean in practice, for a composer, is that a quartet, in looking for new repertoire may well like a piece that is easy enough to learn in a modest number of rehearsals, provided that it is also showy enough to highlight the virtuosity of the ensemble, and that of the 1st violinist in particular. For musical reasons, I am going to leave the piece largely as is, although I have found some spots where the 1st can acquire a few more notes to better balance some things. But in doing so, I have to accept that this quartet, while otherwise written very much with an ear to the string quartet as a historical genre, simply does not speak to the issue of the prominent Primarius. That would be another piece. And perhaps, another composer. One of my teachers once served on a competition panel with Aaron Copland. Faced with a huge pile of entered scores, my teacher, rightly worried about making a fair decision, asked: "Can we really hear all of these?". Copland answered simply: "We can't. We give the prize to the most complicated score because it represents the most work." How could Mr. C. -- of all people, you might think -- have gotten it so wrong? Complexity, or better yet, density, of notation is not a reliable sign of the amount of work put into a piece of music. If you are working in a traditional style or idiom in which the way dynamics or tempi or articulation "work" is understood as part and parcel of that tradition, then one can add a lot of ink on auto-pilot. If you are working in a style or idiom in which all of the notated parameters are fixed by pre-compositional processes, and in particular those idioms -- like Babbittonian twelve-tone technique in which the parameters work together like clockwork, then again, it's auto-pilot time. But if you're working in a musical no-mans land, territory in which neither tradition nor an algorithm can guide you, every bit of ink can represent a wretching decision about the nature of the work. And a decision not to make a mark can be equally hard: letting elements go into the realm of interpretation, allowing performers to make choices in the absence of a well-defined performance tradition, is an act of considerable faith, and one not taken lightly. The amount of work that goes into the training of a traditional musician, or into the development of an elaborate pre-compositional program has to be recognized, but the assumption that the less-densely notated score indicates that less work (less training, less cogitation...) has taken part in its production is simply false. Indeed, the reduction of a score to its most essential elements is often both a representation of an aesthetic of elegance and the product of long, hard work. Okay. 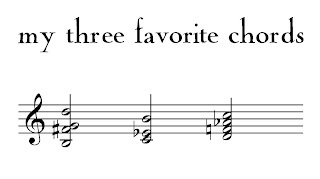 You're not supposed to have favorite chords, at least not in the abstract. Both Babbitt and Feldman would have agreed that it's about the context in which the chords are heard, what comes before and what follows, what repeats and what just passes by. It's about the timing, the duration. It's about the voicing, registration, density, orchestration, doublings, dynamics. It's about the accents. It's about the time of day. It's about the weather. It's about having had a bad day at the office, getting a flat in the car, or losing your house keys. It's about fresh squeezed orange juice, and your daughter laughing for the tenth time at the joke about mayonnaise in the refrigerator. It's about going into a two hand showdown with a pair of fours, a prayer, and an opponent with a nervous tell. But it's not like that. We have associations, tastes, habits. We have, and play, favorites. I used the first chord above, modulating to the fifth above via the two common tones, in my very west coast minimalist piece Multnomah Riffs in 1977, again in a piece for sine waves and crosscut saw, School of Levitation (1983), and most recently in my fourth string quartet, Autumn (2006). 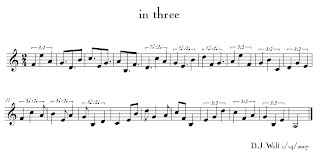 The second chord has figured in a number of pieces, often cadentially, including a chamber orchestra Passacaglia (1982), and the Passacaglia that ends my string trio Figure & Ground. And the third chord, which goes by a number of names in the theory literature, but I think of as a subharmonic seventh chord, appears probably too often for my own good in a number of pieces. I've used each of these chords in a numbers of temperaments and in just intonations. Try as I might, I've never been able to erase any of those associations, nor abandon those tastes and habits. A fault, perhaps, but one with which I will have to live. I've been following Dennis Báthory-Kitsz's We Are All Mozart project, which is, among other things, a study of compositional productivity. Although he has not reached his goal of booking every day of the year with commissions, he nevertheless has a calendar for 2007 with 80-some bookings, which is by any measure an out-of-the-ordinary figure. Dennis's new productivity level is an opportunity at many levels, not least of which is to establish the Báthory-Kitsz compositional brand in a larger market. But at a practical and personal level, it is an opportunity to reassess his own composer's tool box, the body of ideas, methods, materials, and techniques he has assembled with his work to date. How much capacity or potential do those tools have for new applications? How can they be tweaked, combined, recombined, mutilplied or subverted? A project like this, with a projected output of many smaller pieces, confronts two very powerful forces directly: those of the masterpiece ethic and of mass production. The masterpiece ethic is our peculiar inheritence from the post-Beethoven era (the beginning of an continuous music-historical memory), with the emphasis on the blockbuster, the unique work, sui generis, full of sound, fury, significance and import. Mass production, on the other hand, emphasizes similitude, economy of production, and reliability, and sucessful mass production is ultimately defined by profit and a sustained place in the market. With the highest respect to Dennis, I will venture now that none of the WAAM pieces will be "masterworks", but that is (a) neither a critique nor a value judgement, and (B) an entirely irrelevant measure of their identity and value. On the other hand, none of the pieces will be easily assessed or valued in terms of mass production: they are all handmades, their market values are irrelevant, and they will each carry traces of relationships between composer and commissioner that cannot be found in mass production (or at least production above the scale of a Morgan Motorcar). The masterwork ethic and the detachment of "art" music composers from mass markets has led to one major change in our catalogs, and that is a -- to my mind unfortunate -- tendency to devalue the work-overlapping notions of genre and repertoire. From Beethoven onward, there is such importance attached to works as singular instances that, within certain compositional milleux, it becomes virtually impossible to maneuver creatively within a genre. This leads to the psychologically difficult situation in which a composer likes Barraqué can write but one Piano Sonata, and even then cannot ever really finish the thing. (Of course there are always counter-examples, like Hovhaness or Buckinx, both outsiders). Dennis's project may be a great opportunity to revisit his catalog, indeed the whole notion of the catalog, and to reconsider the potential and value of genres. Isn't there something that of unique value that can be learnt when, instead of writing, like Barraqué, the Sonata (-to-end-all-Sonatas), one follows the model of a composer like Buckinx with his 1001 violin and/or piano Sonates? The pressure on a new work to be relevant to and measured against its ancestry, to epitomize its genre, can be both unfair and deadly. But maybe, if we stand back a bit, and allow that a work can be an instance of a genre, without necessarily being a culmination, and we allow for cul de sacs, deadends, and failures, as well as successes, we'll find ourselves on a more productive path. Upama (also spelled as Upma) is South Indian comfort food, a spiced and fried porridge. Like most comfort food, there are uncountable of variations possible, in the type of cereal used, in the spices, or in accompanying vegetables or toppings. I like it best with wheat (oatmeal, rice, buckwheat, bread, and vermicelli are also popular), without turmeric, with the bottom a bit brown and crispy, and served with lime pickle and yoghurt as condiments. I first had upama in grad school, when I shared a house with the vina player and scholar K.S. Subramanian, who turned out to be an extraordinary cooking teacher. 2. Throw in the mustard seeds. 2. When the mustard seeds begin to dance, add the urad dal and curry leaves. 3. Add the onion and green chillies. 4. Fry till the onion is translucent. 5. Add the semolina and fry it till it is light brown. 6. Add the hot water and salt. Stir just enough to distribute the water. Cook on low heat. 7. When all the water has been absorbed and the bottom has begun to crisp, add the coconut or the peas, mix well, top with cashews, and perhaps some fresh coriander, and serve. Subramanian liked to give the dish a squeeze of lemon, sometimes I throw some fenugreek seeds or leaves into the mix. I always eat it with lime pickle* and plain yoghurt. * Lime pickle is great stuff. You can make it yourself or buy it off the shelf in various degrees of spicy-hotness. I wouldn't dare do it myself, but I have it on good authority that some folks eat peanut butter and lime pickle sandwiches. Henry Farrell at Crooked Timber points to a new invention, by David Seah, a probablistic alarm clock, which is just the thing for those of us who like tend to be late, then set our clocks fast, and then second guess the clock, ending up late anyways. The new clock is fast, by as much as fifteen minutes, but you never know precisely how fast, therefore keeping the clock owner from trying to run out the extra time locked into a fixed error. It strikes me as obvious that there is some repertoire -- Viennese, for example -- in which an unpredictable arrival at the down beat is an essential part of the style. This is something rather more subtle that the rubato found in the "human plackback" routines packaged into some notation or sequencing software. (That rubato is essentially a reapportionment of the lengths of the beats within a measure). Most metronomes are built to give you pulses delivered with the accuracy of a Jaki Liebezeit (10 points to the first American reader who get that reference), but I suspect that there'd be a market out there for a metronome with an added degree of uncertainty. There is a tradition of progressive musical pedagogy in the US that ought to be given a bit more credit. The kindergarten rhythm band, when done well, was as vital and musical and inventive as the Orff ensembles, and as with Orff, there is an honest-to-goodness connection to grown-up new music, in that John Cage's developments with the percussion ensemble owe more than a little to his Aunt Phoebe James, whom he assisted in teaching children and in the production of two books on rhythm pedagogy. 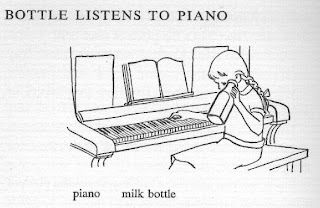 The elementary school music textbooks of the Silver Burdett company had a long tradition of a broad approach, in the editions of the 1970's, the books included new music by Steve Reich, Moondog, and Doris Hays, experiments with tape recorders and a healthy sampling of classical, vernacular, and non-western musics. Ought not to be used lest ears they many harm any. In many of the bits of music here, intended for his young readers to try at home, you can find the genesis of some of Slonimsky's famous Minitudes. (C.f. Lucier: Music for Piano with Amplified Sonorous Vessels). The act of writing a score, rather than improvising or committing something to a fixed recording is a fundamentally optimistic act. It is a signal of a relationship placed in the future rather than of immediate gratification. It implies faith that future performers of the score will approach it in goodwill, as well as acceptance that that future performers will bring the unexpected into the work. Richard Winslow's law, that if you want to repeat some music precisely, you ought to transmit it orally, while if you want to guarantee that the music will change over time, you should write it down, applies. A score may also have a touch of a love letter about it, addressee unknown. The recipient of this letter, the "whom" it concerns, is expected to be active, enaged, participatory, a fundamental rejection of passivity in the face of the world as it is. Sorry, another post about labels. Individual, groups, organizations, and competitions expressly promoting "tonal music" seem to have a growing presence. While many of these identify themselves up front as musical traditionalists or conservatives, and many are simply dilettantes, there are also banner-carriers for tonality in one form or another who cross all stylistic and ideological boundaries. It's now been decades since an appeal to tonality can be heard immediately as a rearguard action, and indeed, there are musics out there which are comfortably both avant-garde and tonal. Buts it's difficult to find anyone out there wiling to give us a definition of "tonal music" or "tonality", and when offered, they are either too broad to be meaningful or too specific to be useful. For example, a definition requiring on the presence of a single central tone or tonic would include Harry Partch's tonality diamond, or Lou Harrison's twelve-tone but pitch-centric Symphony on G, and a narrow definition might exclude music without a clear major-minor tonality, or something from outside the western tradition, like Indian music or Javanese Karawitan, although both traditions share some important traits with western musics that we can probably more easily agree to define as tonal. I have my own ideas about this, but I'd like to hear what others have to say. How do you define tonal music or tonality? People do a lousy job when it comes to labels -- we apply them when they're not needed or even when they're unhelpful or even objectionable. And when they'd really be handy and uncontroversial, we tend, in the rush of everyday life, to forget to make the things. Auto parts, for example. Wouldn't it be great to be able to lift up the lid and find a label -- legibly clear, bright, facing forward and right-side-up -- to that hose or gasket or pump that's demanding its immediate excision and replacement? Instead, we're usually left to the goodwill, if not mercy, of the brotherhoods of mechanics and parts store clerks with their tightly controlled access to catalogs and data bases and other mysteries of the profession. Every once in a while it's useful to survey the insides of computers, checking to see what could or should be upgraded. Of course, somewhere in my (unlabeled) files is a stack of motherboard manuals, and I could go online and search for the information, but shouldn't it be possible to just open up the box and find a clear label identifying the make and model of a motherboard or a the speed of a graphics card slot? I have done a better job in the the kitchen drawer with forty-some spice bottles, each with a little label on top, "galanga", "cardamom (black pods)", or "gumbo filé". No fancy taxonomy, not even alphabetization, just the names, and it's enough. However, the little cabinet with drawers full of nuts, bolts, screws, washers, hinges, and the rest does need more attention, as the lack of labels threatens to turn every minor repair job into a hardware safari. But there are whole domains in which convenient labels are precisely what we don't need, most of them having to do with human identity: politics, or sexual preferences, or religious beliefs, certainly. Aesthetics, music. Real music can be messy and ambiguous, and the best of music is usually both. I find that the utility of a tonal analysis, for example, often reaches its maximum at precisely the point in which one cannot honestly decide between alternative descriptions. (I've been trying for months to write an item about Sibelius's Fourth and Seventh Symphonies. But each time I try a label on for one feature or another, it vanishes, like sand between fingers. His inventions -- melodic, textural, formal -- are real and abundant, but they are always elusive, not wanting to be pinned down in one way or another. With Sibelius, it's like hit-and-run driving: you never hear anything coming, and once its gone, you're never quite sure what hit you. The only certainty is that you've been hit). A piece of music, or a work of art, or a person: complicated, contradictory, frustratingly and joyously refusing to let any label stick. I can't imagine a better state of affairs. 2 lbs. 12 ozs. Fresh potatoes, preferably 'new' potatoes. Redskins are especially delicious. 2 Eggs boiled for 10 minutes. Omit egg yolks if you wish to keep this a strictly non-fat recipe. Steam potatoes whole. Cool and cut into large bite-size chunks. Dice celery into smaller chunks. Combine all the wet ingredients, then add the dry. This recipe was inspired by my mother, Evelyn Young's, potato salad recipe, but in my hands it changed radically: her recipe included mayonnaise, salt, and 1/3 cup milk. and it did not include the yogurt, herbs and cayenne. Copyright (c) La Monte Young 1991, used by permission. Hurricane Kyrill is at work over Germany at the moment. It's been mild in Frankfurt, but much damage has been done, and lives taken, on the coast and in the central mountains. Storms are acoustically rich and musicians have sometimes sought to emulate, if not imitate, that richness. As a kid, I liked playing J. S. Bach's unusually programmatic Capriccio on the Departure of the Beloved Brother (BWV 992), with its evocations of weather good and bad. Two more recent composers, John Cage and György Ligeti, abandoned major projects involving storms. 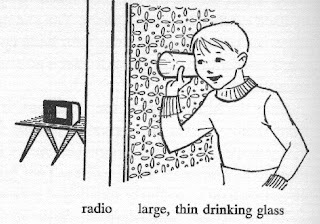 Cage wanted to set the "Ten Thunderclaps" from Finnegans Wake, intending to use electronics to transform vocalizations of those ten hundred-letter words, intending an experience that would be "more like going to a thunderstorm than to a concert." While some of the ideas for the piece were apparently taken up in his Lecture on the Weather, to texts from Thoreau, the Ten Thunderclaps piece was never made -- whether for lack of the right technology, or lack of a commission (Cage, a very practical man, never composed without a clear commission or prospective performance), I don't know. Ligeti wanted to compose his storm as the opening for an operatic setting of The Tempest, and preparation for the piece involved some study of the complex dynamics of heavy weather. Indications were that he was investigating the application of some serious computing to realize his storm. But Ligeti abandoned The Tempest for an Alice in Wonderland-based project, which was not ever really abandoned, but was never finished. So, if you happen to encounter a composer who insists on talking about the weather, please don't assume that she or he is just talking about the weather, that is to say, about nothing at all. Talking up a storm may be pre-compositional cogitation: we take the weather seriously. The estimable Frank J. Oteri, over at the New Music Box of the American Music Cartel Center writes thoughtfully about the concept of a "piece" of music. But the term piece is useful, too, and Oteri gets it right. It's more particular than "work", which can stand for everything one does. Piece instead carries the sense of being a part of a larger whole. This could be the larger whole of music itself, or a platonic ideal, of which the piece is but a shadow. It could also be pejorative, in the sense of piecework, part of a mechanical production line. But I do think that this sense was very important to some of the composers in the experimental tradition to whom I looked up as a student, and continue to be challenged by. With Alvin Lucier, or with La Monte Young, the question of the number of items in their catalogs was often difficult to answer. The items were not stable quanta, but rather dynamic fields of ideas which congregated or segregated as the composer came to discover, define, or clarify what belonged, or what didn't in one piece or another. This experimentation with the extent and limits of a piece, and the consequent willingness to let go of a fixed notion of a work's identity, is something that I've dearly missed in other musical traditions. The New Complexity folk, in particular, for all their cycles and systems, seem at core to be reinforcing a very conservative attitude about the nature of a piece, and like most musicians, the idea of a piece is closely identified with the subject of a commission. Isn't this forcing a reconciliation of the music its commodification? I must admit to one strange, almost ritual, use of the word piece, as a substitute for the proper title. Rather than say the title, I'll say "the trombone and piano piece", as if uttering the title itself is taboo, an interference with some magic inherent in the name. Or maybe, the proper title, like proper names, is a signal of an intimacy that one doesn't wish to flay about in public, and the magic is present in that intimacy, not the name itself. * Norman O. Brown's essay, "My Georgics", in the collection Apocalypse and/or Metamorphosis, is a fine celebration of work. Even better, go back and read the Georgics of Virgil, always an encouragement to do one's own work. I find some discomfort with various commonly used words for what we do. Never like the term "show" for a concert performance or recital. A "show" is for promoting or selling bloated automobiles and other such new junk. "Work" fits for what I'm doing when I make a "composition". "Composition" then becomes a noun and the confusion of "work" as a noun or verb or whatever is minimized. "What am I composing?" becomes a rational question. I can take the group "work of art", or "art work", generally or sometimes, depending on the context. Doing my taxes is certainly "work" and for my situation it consumes more unrewarding perspiration effort than any other required activities except perhaps for when I was required to be in "committees" to decide the career fate of others in academia. "Piece" is also problematical because it has the implication of a fragment or part of something. I think it was La Monte who made a "Piano Piece" that consisted of a piece of a piano -- a piano leg as I recall -- displayed on the stage. When I'm asked what I'm working on these days, I have to struggle a bit with my answer. "I'm working on a piece for two pianos" is satisfactory because I'm actually working on a piece of the planned composition. But my word "piece" in the answer is most likely heard/understood differently. Sometimes an answer to the above question is easier by using a specific title, as "EX STREAM for Tomoko Mukaiyama" in my recent composition RENDITION SERIES. Easy there because the EX STREAMS are parts of the larger composition. Just as a "Sarabande" is part of Sebastian Bach's FRENCH SUITES. A lower-brow possibility is the question "what are you making these days? ", though it reminds me from my late teen-age days of the question "who are you making these days?". An amusing blur of contexts. You suggestion of the idea "dynamic fields of ideas which congregate or segregate as the composer... discovers, defines..." etc. is the most inclusive definition I've seen. Though you suggest the relevance to the creative work of Alvin Lucier or La Monte Young, I like it because it allows the appearance of the "process" of composition. and as you say, isn't "forcing a reconciliation of the music to its commodification." Sometime around the turn of just the past century I was asked from an academic source for a definition of the word "music". After some thought about the context of the question I gave them this quasi-pompous but largely inclusive reply: "Music is a network of ideas, interconnections and creative decisions, presented in time as patterns and relationships of sounds." I've no problem with using the word "sounds" above, because I consider "silence" as one of the components of "sounds'. Rests in music can be heard (if heard is the right word) in several ways. The most basic, perhaps, is the the Cagean tacet, which is marked only by the temporal structure of a work, and stands in a curious negative relationship to the time outside of that structure, before and after the pieces as well as between movements (Cage's famous 4'33" is a work in three movements, the beginnings and ends of which are articulated by the pianist moving the lid to the keyboard). In Cage's tacet, the time envelope of the piece proper in filled by sensations usually assoicated with the time when music is not played. Then there is the "zero time" of Christian Wolff's cued pieces, which strikes me as making in the unmeasured, out-of-time, breaths and pauses and fermati of ordinary performance practice. (Luigi Nono would greatly elaborate the expressive potential of the fermata in his late works, especially the String Quartet, Fragmente - Stille, an Diotima (1980)). But here we're dealing with a more traditional type of rest. One type has an edge of unclear or even indeterminate dimensions, into which sounds vanish or out of which they appear. Personally, I'm not much of a fade in/fade out kind of composer, and I don't use the diminuendo al niente marking that are popular among a certain circle*. Another kind of rest, and the one used in the small examples above, has a hard edge, silently articulating a pulse, a metre, the end of a tone, or the gaps between tones. The first exercise confounds a metre, by assigning rests to the points in the measure which articulate the metre most strongly, while the second reinforces the metre and metric changes by only articulating (with one exception) those points. * al niente, candles, masks, and stroked wine glasses... How is it that bell-bottom trousers and mood rings went away but we're still stuck with al niente? Another musicianship exercise. The first line uses one of Morton Feldman's favorite tricks, holding a division of the measure, but changing the measures' lengths, in this case sequenced to create a written out accelerando. But this increase in speed comes only in measure-long chunks, so it might sound, well, a bit chunky. The second line is one solution to this: by including a more propulsive rhythm within each measure. 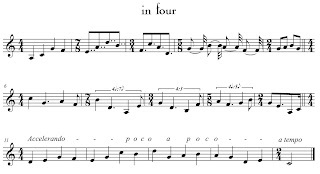 Finally, the third line attempts to remove all the chunkiness altogther by placing the entire transition in 4/4 metre under an accelerando poco a poco marking, and return to the initial tempo in the final 2/4 bar. This last, smooth solution is also the most difficult to perform accurately, but can be efficiently practiced by going through intermediate steps like those described in lines one and two. This is a small exercise, for my son, in what might be called written-out rubato. Each of the divisions above is a real example of how an ordinary triple division might get played by real players. Depending on tempo and articulation, the feel of a triple rhythm can be sustained or give way to another prevailing division of the measure. The point when this change of feel occurs (or doesn't) can be rather effective, creating a kind of audible illusion space. Back in the early days of midi, getting rhythms right meant quanticization by hand, which meant trying to approximate rhythms by spreading them over a group of discrete midi units that didn't neccessarily divide as nicely as one would have liked. Many midi software packages now have quite complicated algorithms to figure out how a real performance, with all of its variations in rhythmic detail, should be clearly notated. It's fun to try some composition exercises based on this idea: Write a simple accompaniment, in a clear double division of the measure, to the melody above. Just oom-pops, if you like. Try both a plain vanilla quarter-quarter division, and then a less stable rhythm, much like the melody itself, but based upon a double division. Then add phrasing and articulation to either support or obscure one metre or the other. SFMike of Civic Center and M.C- of The Standing Room, a pair of excellent photo-and-commentary blogs from San Francisco, have teamed up with an article on a Chinese New Year's event presented by the Falun Gong organization. I've had some training as an ethnomusicologist, and have done a share of fieldwork, but was never quite prepared for an event like this. Hagel: I think this speech, given last night by this President, represents the most dangerous foreign policy blunder in this country since Vietnam, if it's carried out. Hagel: Putting 22,000 new troops, more troops in, is not an escalation? Would you call it a decrease? And billions of dollars more? There is no entry fee. (So that the prize money is not being raised by raiding the pockets of the competitors). The competition has a clear theme (In this case having to do directly or indirectly with the life and work of Carl von Ossietsky, the pacifist and journalist awarded the Nobel Peace Prize while imprisoned by the Nazis). The jury membership is listed in full. No age limit. (Which was not a critique point on the Cincinnati competition). Well-defined parameters for the forces required, including duration and degree of difficulty. (Again, not a problem in Cincinnati). See, it's not so difficult to get it right! Over at the New Music Box, Jacqueline Humbert has an article about performance practice in Robert Ashley's operas. Ashley's operas have been performed by a core of performers, including Humbert, Tom Buckner, Joan La Barbara and Sam Ashley, with and for whom he has developed a body of techniques and practices that are both efficient and rich in possibilities for realization. To some extent, Ashley's operas bring us full circle, back to the origins of the genre. * The score, or better yet, performance materials, for a Monteverdi opera, share some important qualities with the performance materials used by Ashley. Some aspects are well-defined, others depend upon a mixture of tradition and the imagination of individual performers for their realization. The connections between basso continuo and melodic ornamentation and instrumental and vocal techniques used by Ashley are obvious. (There is a lot of chatter about Ashley as a grandfather of rap -- nah, recitative and text setting in classical Greek drama or Chinese opera or epic recitation across the planet all point to an ancient and shared inspiration, to go into the space between speech and song; a more interesting idea would be to see how the drive of rap might revitalize recitative or if rap could discover, from Ashley's example, a more extended dramatic genre). The aspect of efficiency is not a trivial one. Composers, here's the first law of musical practice: there is never enough time for rehearsal, and you cannot expect all your performers to come prepared. Therefore, keep things clear, and find shortcuts that are not insulting, but rather call upon players and singers to use their own bags of skills. When musicians feel that their own resources and talents are being recognized, they will be more likely to deliver the goods. There is also a deep connection between the impulses that led to the invention of the Italian and Ashley's operas -- both came about in historical moments demanding a search for roots, origins. The Italians turned to classical culture and history. Ashley, who early on, as a pianist, realized that neither the European classical tradition nor African-American music was "his own" tradition turned toward themes and settings that were very much part of the life and landscape of the US. And instead of the gods, demi-gods, heroes, and emperors of myth and history in Monteverdi's music drama, Ashley chose bank robbers and barroom piano players, and more recently, the elderly and the homeless, uncovering the myth and history in ordinary American life. * There's a similar observation someplace (Tom Johnson?) about Philip Glass and Robert Wilson's Einstein on the Beach, in which the "Knee Plays" connect to the instrumental ritornelli of the early operas. Promoting music, especially new music, is tough, and especially so when you don't want the noise of the promotion to mask the music. Networking online seems like a good idea, an extension of what had been practiced in the past. I don't know if it's strictly an age thing on my part, or that my hipness expired somewhere in the late 14th century, or that it's my photo you'll find next to the definition of misanthrope in the latest Webster's, but I just can't see myself trolling about for "friends". Moreover, my rights organization (GEMA) still hasn't figured out how we can put music online and get reasonably paid for it, so I'm pushing scores instead, and they don't really fit into the MySpace format (which is pretty ugly and limiting, as long as I mention it). I realize that a blog like this is in the same ballpark as a MySpace page, and bloggers link one another with the same zeal and discretion with which MySpacers make and rank their "friends". But this blog is basically the journal that I had been writing anyways, from well before the blogoplan was a pup, so maybe I have some excuse. And if, by making this public, I earn a couple of friends or enemies, well, bully. 2. In response to some complaints about readability, I've switched the color settings on the blog. The new scheme is not as hard edged as the old white-on-black, but the new black-on-gray, with touches of white and maroon, seems more legible while sticking to colors I like. As to content and text readability, your mileage will continue to vary, so please don't shoot the blogger, he's doing the best he can. * Allow me to confess that, living in a non-English-speaking environment for most of the last 18 years, I only learned the meaning of the word "swag" this afternoon and couldn't wait to try it (I'm still not quite sure exactly what a "tivo" is; any help?). Hence this post. ** But should you insist on a review here, we can certainly work on a cash basis: Swiss Francs, in unmarked tens and twenties in a freezer-proof bag. Roger Bourland has found some footage of a Jack Paar Tonight Show, with guest Richard Nixon playing his own piece. As a piano player, I'd say that Nixon ranks with Truman, but his composing chops are new to me. Should we be worried that the only composers among prominent American politicians include Nixon and Orin Hatch? (I know that we should be worried that Kent Wheeler Kennan was the brother of George Kennan). Adam Baratz has a nice bit of reflection on recipes, score reading, and performance practice, one of my favorite clusters of topics. And here are some links, to YouTube footage of Groucho Marx with Jackie Gleason, with Professor of Hippology Lord Buckley, and with Frank Sinatra. And of course, Groucho's grand arrival as Capt. Jeffrey Spaulding from Animal Crackers, and this account of Capt. Spaulding's adventures, wonderful reminders of the lost juncture between operetta, vaudeville, and film comedy, and the fact that Michael Jackson stole all his moves from Marx. John Cage had a marvelous way of demonstrating things to non-specialist audiences, for example, the time brackets which are a feature in much of his later work. Standing, he would explain that he would use his arms like the second hand on a clock (a conducting technique he first used in the Concert for Piano and Orchestra), starting with one arm at twelve o'clock, and then moving clockwise, switching to the other arm at six o'clock and continuing on to twelve. He instructed one (or more) person(s) to (each) make a single sound -- typically percussive or vocal -- within the course of that revolution. Now, with a single person, he or she could make their sound right at the beginning, twelve-on-the-dot, and then the rest of the revolution would be an extended decay, release, rest, and wait for Cage's arm to return to the top. Or the player could try to hit the precise middle point in the cycle, a syncopation that -- as Cage's movement was continuous -- was difficult to judge as accurate or not. Or the player could wait 'til the last possible moment to make their sound. Or one could try to get their sound in at a point relatively unmarked by any discrete position on the clock-face. In practice, some players would jumpt the gun, inserting a grace note, if you will, before the clock began, and others were inevitably too late, either coming in after the revolution, or failing to make their chosen sound. The point of the exercise was, of course, that all of these possible realizations, each of which describes a unique formal relationship, can be interesting, and, potentially useful for music-making. I believe that these relationships are interesting both as immediate psychological responses -- responding, for example, to the tension created in our perception of the ratio defined by the sounding event between elapsed and remaining time -- and as representations of abstract or primitive forms. And when more than one player was involved in the demonstration, the relationships between the multiple sound events -- independent or congregating, detaching, fusing or flocking -- gained additional complexity in terms that might include the sociological. There have been some performers (conductors, mostly) who have chosen to remove the extemporaneous element from the realization of scores with times brackets, typically by specifying precisely beforehand when a sound should begin and end, instead of allowing the player to make these choices on the fly. While I dislike this practice for its deviation from the spirit of a performance ideal with which I largely identify, and it does strike me as recomposing Cage's work rather than taking the courage to do ones own work, I can take considerable solace in the fact that actual performers will respond to the more specific notation by introducing additional nuances, if at a much more local level. All of the nuances described above for the ordinary time bracket will be reproduced -- early or late entries, on-or-off a perceived metric, and sounds simply missed or mistaken -- because, if it hasn't been noted before, rubato has a fractal dimension. Now I know why I've never been able to wear a watch: I like going to the movies, but would hate to live in a movie. Music, on the other hand, not being governed by inexorable forward motion of a maltese cross, is all about the possibility of time travel both forward and back. Name: (1) a book that you want to share so much that you keep giving away copies, (2) a piece of music that changed the way you listen to music, (3) a film you can watch again and again without fatigue, (4) a performer for whom you suspend of all disbelief, (5) a work of art you'd like to live with, (6) a work of fiction which has penetrated your real life, and (7) a punch line that always makes you laugh. Forward this to three people. (7) "Did you see that? That was our dog?" I forwarded this to Patrick Swanson, whose response is here, to Roger Bourland, who has a list here, and Tom Hilton, of If I Ran The Zoo, who is hard at work on his. These memes are really just questionaires of the sort played in parlors in the late 19th and early 20th centuries. Musicians played them back then, too. Debussy, for example. The best know questionaires are the two answered by Proust, including such zingers as " What do you regard as the lowest depth of misery? ", "What is your idea of earthly happiness?" or "To what faults do you feel most indulgent?." The composer Gordon Mumma, writes in response to some of the recents posts here, amplifying and extending the discussion with his usual enthusiasm. Many thanks to Gordon for permission to quote him at length. their playing and sound control. of the conductor, resulting in acoustical mud for the string sections. thus distorting the glorious realities of live instrumental performance. the automobile radio-sound on noisy highways . and bass to the right of the conductor" arrangement. The "thickness"
Concertgebouw Orchestra, in their superb performance hall. orchestras, you'll find the "Mahler" platform often still in use then. the fugal-finale of Mozart's JUPITER SYMPHONY. (e.g. Universities) as though "that's the way it's always been". string-section players who don't perform in the work. the "Western art music" traditions. Looking beyond that "western"
could circular breathe it if Mitropolous preferred it. amplification of recorded sounds. " but most of the cultural stuff is trimmed way down. the time of 1950s and Cold-War cloud. The politics of "editing"
BBC World one-hour documentary last year of the "9/11" history. and the second half was about the 2001 NYC trade-center occasion. only 30 minutes: the first half was completely removed. " I cannot help thinking that the pumping action of the foot may have been very disturbing and that, for very long passages, the cor anglais player may have had to ask a trusted colleague to take over the pumping for a short time so as not to disturb the embouchure. It had also occurred to me that the playing of concertos might be difficult because the foot-pumping could be awkward when standing up, and impossible if the player had only one leg. There could have been a very long air pipe going off-stage and into the wings where the pumping could be concealed from view. It may be that for very long cor anglais solos the player had several air pipes in his mouth and that several of his colleagues operated foot pumps so as to make sure he did not run out of air. Maybe they took it in turns to work the foot pumps as each colleague became exhausted. It would have been necessary to keep careful watch over the cor anglais player to make sure he did not become over-inflated. As a safety precaution the cor anglais player may also have had a foot pump with an air line going into the mouths of his assistants so he could signal his distress if either he was receiving too much or too little air. The extent of a player's breath is a constant concern in music for wind instruments, and composers make demands for extended tones or breathless passage work at their own peril. A few players have mastered the art of circular breathing, most famously Harry Carney, baritone saxophonist in the Ellington Band, who would hold a single tone long past the rest of the ensemble, in a kind of solo cadenza reduced to a single, very long, fermata. Circular breathing is, however, a fixed part of wind instrument technique in many parts of the world, and is particularly useful when playing a drone. The Australian dijeridu, an instrument that has justifiably gained some popularity, is at its best when played with a circular technique. The late virtuoso South Indian flutist, T. Viswanathan, told a hilarious story about an itinerant Mukha Veena player, who showed up to pay his respects at the death of Viswa's sister, the great dancer Balasaraswati. This Mukha Veena player sat at the floor, asked for one cup of water and an additional empty cup, whereupon he took out his Mukha Veena and a plastic straw, and proceeded to play, using circular breathing and simpultaneously drinking the water in one cup out of one side of the mouth and emptying it into the second cup out of the other side. Seemless and noiseless circular breathing is, unfortunately, a rare technique among most players of western instruments, and many of those who do use circular breathing techniques do so at the cost of an unsteady tone, extraneous noises, or a distracting visual presentation. Electronic technologies -- delay lines and the like --, as successors to Samuel's mechanical Aerophon(e), may solve the problem in some cases, but there will probably always be a place on stage for the artist able sustain a tone for a while longer than the audience can hold its collective breath before exploding into awes of relief and well-deserved applause. * The original, French, name seems not to include the "e" on the end. Aerophor(e), with an "r", would connect it to the undersee diving device as well as a machine used in infant care, and would convey the Greek root sense of an air supply. Musicians, of course, would take kindly to a device with a phon(e) ending. English language sources sometimes include the final "e", and among these, the Harvard Concise Dictionary of Music and Musicians demands it and scolds Strauss for using the -phon form. But AFAIC, I'll go with Strauss and the HCDM&M can take its pedant final "-re" and shove it somewhere where the Aerophon will not blow. Here's a second video of an earlier performance, unfortunately with sound and image out-of-sinc. Nevertheless, the variations in Kleiber's technique are fascinating, particularly the fluid changes between over- and under-conducting. The finest conductor of the late 20th century. Basta. Not all pieces in a composer's catalog need to have the same weight. Some pieces can be smaller in scale, or more modest in ambitions or resources required. (The complete Mozart (NMA) online sure confirms this). Not all pieces need to respond to a commission or be intended for professional or public performances. In 2006, alongside the largish pieces (three ensemble pieces, two string quartets, the beginnings of a music theatre piece), I managed to do a number of occasional pieces, including a curious little Gnomic Round, for Larry Polansky's round collection, Mr Brenner, His Pavane, for a younger colleague, a specialist in chaconnes, and a set of 12 small keyboard Preludes for amateur use, some of which I've put online here for household use. Smaller pieces are often just the training grounds for larger pieces, but they can also have virtues of their own. In making the set of Preludes, I realized that the prelude form, especially when divorced from the necessity of being the prelude to something else, was essentially a cadence extended into a minor epiphany, and is really an intimate form for the private sphere. This contrasts strongly in function with an etude, which has a technical premise, thus inviting -- should the technical premise be realised -- a more public format and display. (NB: 2007 may be my year of Etudes). But the best thing about a smaller piece is that it practically invites the composer to take a risk, to try out an idea or some material with which the outcome is less than certain, and the taking of which insures that music stays modern. A serious question: What is wrong with the music of Shostakovich? I find widespread hostility to his music from many people, particularly people with musical training (less so from non-musicians), yet almost nobody has been able to tell me what precisely they dislike. My intention was not to deprecate the music of Shostakovich, but rather to elevate that of Sibelius. I'm not, in fact, hostile to the former but respectfully distant (his Fourth Symphony makes my short list of composers who were at their best in their fourth symphonies: Brahms, Ives, Sibelius, Piston, Harrison). But I do have one great reservation: as far as I can hear, Shostakovich's music does not pose a fundamental challenge to the way in which music is made or heard. The conservation of a particular tradition of listening and music-making is an inseparable part of Shostakovich's music; it is music that both demands and fits study and performance in a conservatory environment. For the listener, the parameters of that which is understood to be music are the same before and after the experience of one of his scores. His music, often with great technical virtuosity and direct -- even when sarcastic or ironic -- emotional pull, plays well-behavedly within the established parameters. My ears, however, are always drawn to that which is less well-behaved. Although I can recognize the traditions from which Shostakovich's music was drawn, and locate his music as a unique instance of that tradition summed-up, I cannot, personally, as a composer, locate a productive path forward from or out of Shostakovich's music. In part this is due to simple ethnographic distance to the topoi and traits of his tradition, and a particular distance to his version of the grotesque topic (a distance which I do not have with Ligeti's version of the same). But it is more due to his technique. From the movement-to-movement eclecticism with which Shostakovich works, there is indeed the "polystylism" of Schnittke, and perhaps sampled music lies beyond this, but this is talking about material rather than a way of working with material, and a way forward would have to be found there instead. It may be reasonably objected that my criteria are those of a musician, and a composer besides, and not those of an "ordinary" listener (whoever that may be). But frankly, I'm not much interested either in ordinary listening, that is, listening reduced to some normative experience, nor in ordinary composing. Life's too short and music's too precious to waste on the ordinary when the extraordinary is available. Shostakovich's technical gifts were great, but they were assembled from the tools that every schoolboy virtuoso knows, whether Musiker or Musikant.